When your appointment is over, please make sure you have your appointment tick on the circles opposite (each circle represents an appointment). As you can see, when you make your sixth visit you will receive a 10% discount! The rewards get even better as you card becomes full. Our rewards programme has been created to recognise our regular clients and to ensure they receive automatic benefits from being a Jimmy Chop Chop client. In short, the more you use our salon, the quicker your rewards will accumulate. 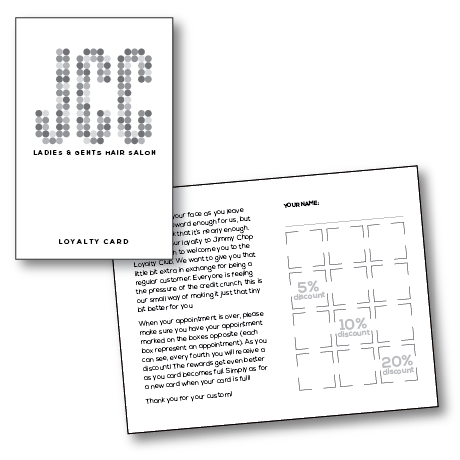 We’ve been running our loyalty card scheme for many years but now we have introduced a new card, especially designed to reward our regular blow dry customers. 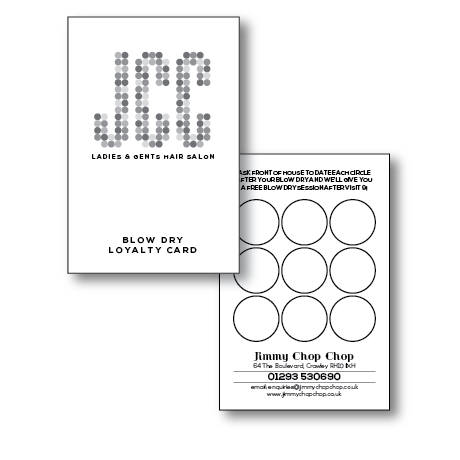 This rewards card is designed solely to be used for blow dry customers and does not include any other services. The card is for the named person only and cannot be shared. The free blow dry is valid for three months from the date of the named person reaching the that ninth circle on the loyalty card. The free treatment can only be a blow dry. All treatments MUST tally with our computer booking system and we reserve the right to refuse the free treatment accordingly. As a thank you to our regular gentlemen customers for choosing Jimmy Chop Chop we have created a reward card for your loyalty. Collect five dates on the card and you receive a 50% discount* on your sixth visit to the salon. Simply get each box dated after your appointment and you will be on your way to a magnificent discount! 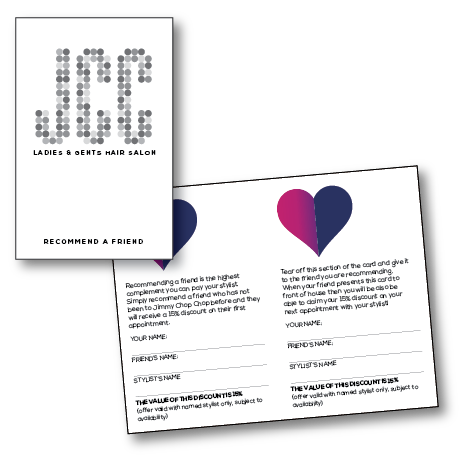 This rewards card is designed solely to be used for gent’s cuts and does not include any other services. The free cut is valid for one year from the date of the loyalty cardholder reaching and completing the 5th square on the card. The free treatment can only be a gent’s cut. All dates on the card MUST tally with our computer booking system and we reserve the right to refuse the 50% discount accordingly.